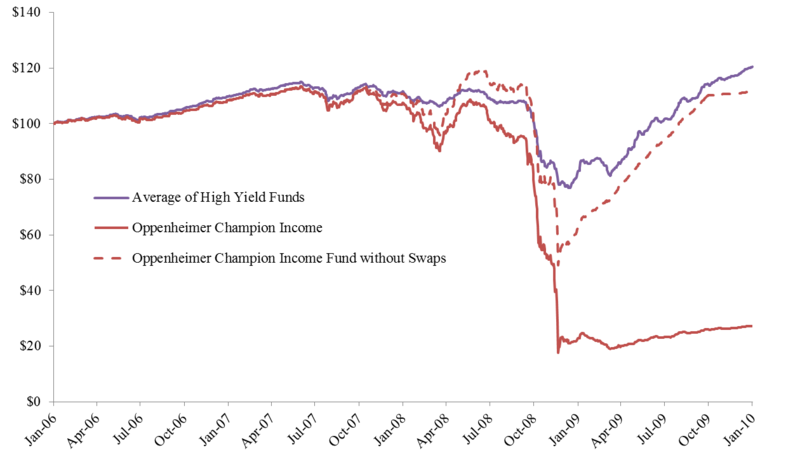 Figure 1 Oppenheimer’s Champion Income Fund Extraordinary Losses Were Due to Leverage Taken on with Credit Default Swaps and Total Return Swaps. UBS Willow Fund, L.L.C. (the "Fund") was organized as a limited liability company under the laws of Delaware on February 1, 2000. The Fund is registered under the Investment Company Act of 1940, as amended (the "1940 Act") as a closed-end, non-diversified management investment company. The Fund's investment objective is to maximize total return. The Fund pursues its investment objective by investing primarily in debt securities and other obligations and to a lesser extent equity securities of U.S. companies that are experiencing significant financial or business difficulties (collectively, "Distressed Obligations"). The Fund also may invest in Distressed Obligations of foreign issuers and other privately held obligations. The Fund may use a variety of special investment techniques to hedge a portion of its investment portfolio against various risks or other factors that generally affect the values of securities and for non-hedging purposes to pursue the Fund's investment objective. These techniques may involve the use of derivative transactions, including credit swaps. The Fund commenced operations on May 8, 2000. The fund’s annual and semi-annual reports can be downloaded off the SEC website here. While the fund managers claimed to be investing in distressed debt, in late 2007 and early 2008 they were aggressively shorting high yield debt. The Fund increased its short position in 2008 and 2009 betting that credit spreads would widen further. The upper panel of Figure 2 plots the notional value of the Willow Fund’s credit default swaps as percent of the fund’s non-CDS assets each quarter and the lower panel of Figure 2 plots the Fund's semi-annual profits from 2003 to 2012. Consistent with the Willow Fund’s disclosures, in the early years it invested in securities of distressed companies and hedged out some of the credit risk in its portfolios by purchasing credit default swaps. From January 1, 2003 to June 30, 2007 the Willow Fund had $309,415,927 in profit. From June 30, 2007 to December 31, 2012 while the Willow Fund’s portfolio deviated substantially from the Fund’s SEC filings, the Fund suffered losses of $287,576,818. Figure 2 Willow Fund’s CDS Notional Value as a Percent of non-CDS Assets, Quarterly. Profit and Loss in Millions. The Willow Fund’s 2012 collapse has received some media coverage which focuses on the Willow Fund’s bets against sovereign debt but the losses it suffered and its ultimate collapse would have occurred whether it was short only high yield corporate credit rather than short a mixture of corporate debt and sovereign debt. * Oppenheimer’s settlement with the Securities and Exchange Commission over this conduct can be downloaded by clicking here (PDF). Much of what is said in the SEC Complaint against Oppenheimer can be directly applied to UBS Willow Fund as well.